In 1984, the city enacted new zoning to try to prevent Broadway from losing much of its Parisian ambiance that resulted from its fairly uniform street walls and cornice lines. The result was a group of new apartment buildings that were considerably more attractive and much more contextual than those of the previous building generation that generally were eyesores. 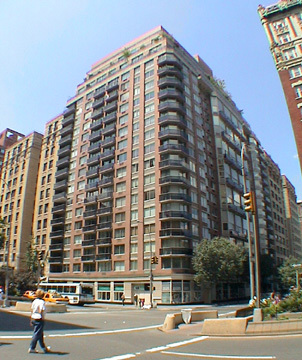 The upper 80's and the 90's witnessed a major construction boom and one of the most attractive new buildings was the New West, a 22-story, 158-unit condominium that was designed by Philip Birnbaum & Associates and completed in late 1986. Harvey Schulweis and Bill P. Nikolis were the developers. The Broadway corner of the building has wrap-around balconies and the sidestreet's façade is nicely modulated by with recesses and a series of double-height units, a welcome throwback to the artists' studios with north light. This handsome building is on the former site of the Standard Theater that was designed by Thomas W. Lamb in 1914 and subsequently was used as a supermarket. In addition to a health club and pool, the building has laundry facilities on every floor, a sundeck, a private garden and video security.